The serene rolling hills of Ocala may be best known as Florida’s equestrian center, but golf-lovers will find that those same hills make great golf courses! Golfers know that a business trip or vacation is not complete without at least one game on a premiere golf course and the Holiday Inn & Suites - Ocala Conference Center has some of the best in the area. Golfers of all skill-levels will have a fun experience at Candler Hills Golf; for those wanting a challenge, try the more difficult links at Golden Ocala Golf and Country Club. We have listed a few of the local courses below but there are many more in the surrounding area. 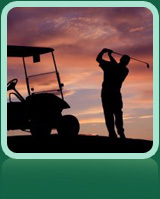 Visit the link below for a good website to look up additional Ocala golf courses. Our all-new Holiday Inn Hotel offers 133 guest rooms and 36 suites, tastefully decorated and well appointed with all the services and amenities you expect from Holiday Inn. Each room features high-speed Internet access, a spacious work desk, luxury bedding and more. We promise that our hotel and exceptional customer service will make you feel right at home. All reservations booked from this website are eligible to participate in the Priority Club® Rewards program and are backed by our Lowest Internet Rate Guarantee®.